World, meet Jude. Jude is a big ol’ fan of Warhammer Fantasy, the setting of many tabletop, role-playing, and video games. 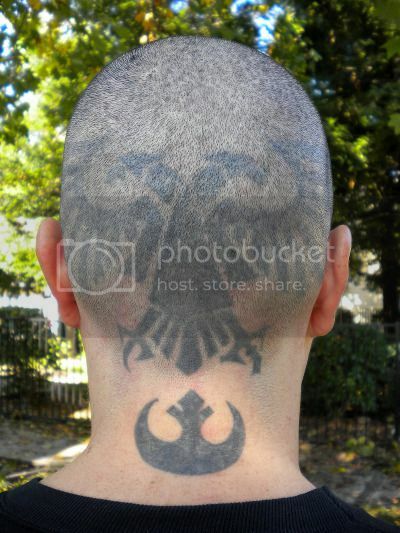 Curiously, Jude also has a tattoo of the symbol of the Rebel Alliance from Star Wars tattooed on his neck… below the hairline. So, if he ever decides to stop attacking his head with an electric razor on a twice-weekly basis, the only ink left showing will be the Star Wars ink. I’m sure his two youngest kids–Luke and Leia–appreciate the gesture. Check out Jude’s blog for more photos of his various Warhammer tattoos. * No. I didn’t know, either.